Last month, Stampin’ Up! not only celebrated Paper Pumpkin’s 3rd Anniversary, but also the shipping of the One Millionth Paper Pumpkin Kit!! Now we know that SU! loves to celebrate, and celebrating means sharing with you, fabulous customer! 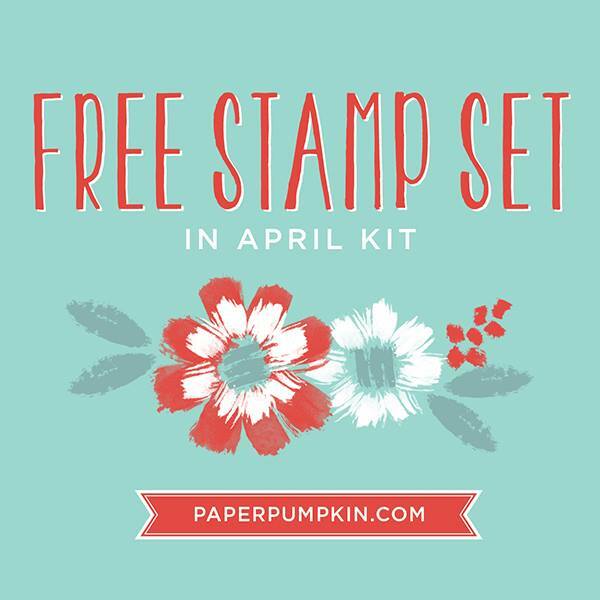 So to get your FREE stamp set, all you have to do is sign up to receive the April Paper Pumpkin Kit by April 10th, and in your kit you’ll receive this exclusive free stamp set! Yes, you will still receive your full Paper Pumpkin kit, complete with it’s own stamp set & everything needed to put together this month’s project; the free stamp set is in addition to all of that! Sign up for Your April Paper Pumpkin by clicking HERE, fill out your information, and sit back & wait for the fun to be delivered to your door! You’ll receive a notice of shipping around the 12-15th of the month, and it will arrive about 5-7 days after that.